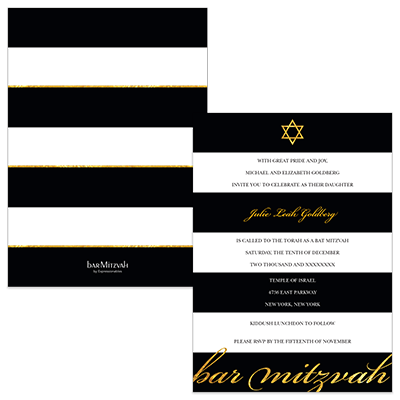 This classy Mitzvah invitation features black and white stripes and gold accent lettering. The gold accents on the Star of David and either Bar, Bat, B'nai or B'not Mitzvah feature a glitter like design to give it a 3D type look. This card is also two-sided and features a continuation of the stripes and gold on the back of the card. Card measures 5x7 inches and comes with matching white envelopes.